.......53 Buddhas and Me .................My Life Adventures.....: Well I Never!! Back in Daylesford for the weekend, breakfast for my guests was all over so Shane and I decided to go for a drive to Castlemaine. 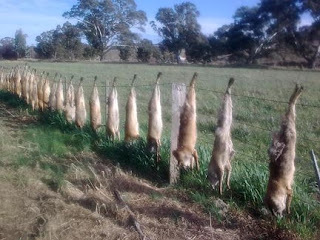 Castlemaine was originally started in the gold rush days but a lot of employment now is farming and one of their main pests are foxes. 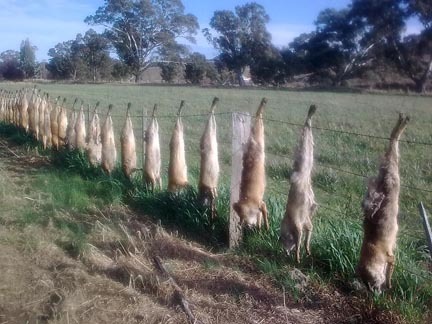 As foxes are an introduced animal in Australia they can be very devastating to a paddock full of sheep. Driving along the road we came across something I have never seen before. Someone has had a busy day getting rid of their enemy and from their display they are pretty proud of themselves. ### Thats 35 times proud ###. Can you believe I didn't even have my camera with me - so I had to take this shot with my phone. Bit blurry because it was pretty windy and I was getting blown around.